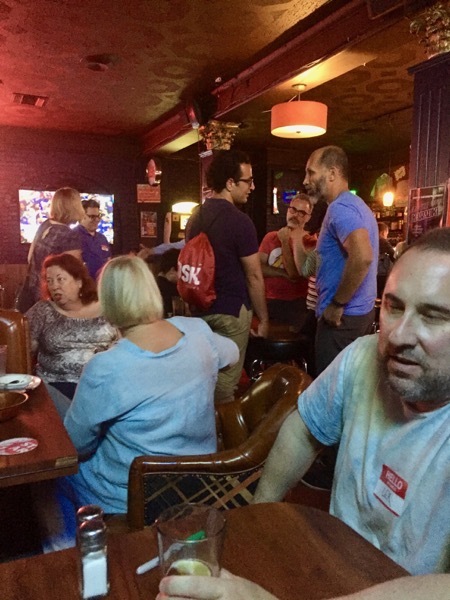 Met a lot of nice podcasting people last night at this new Meetup, right here near the house. 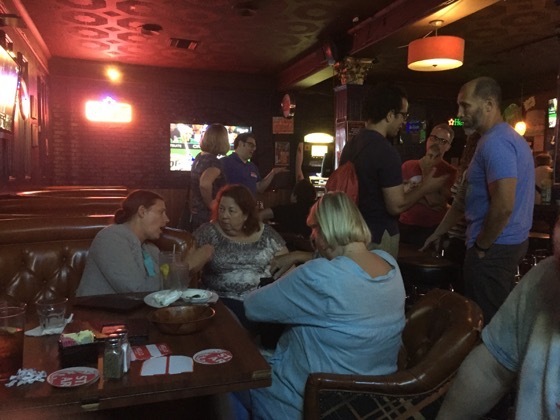 While this was labelled a meetup for fiction and performance-based podcasting, there were a lot of non-fiction folks and a host of technical questions getting discussed. It was great having a Meetup like this right near the house. We could have walked if it hadn’t been so warm. 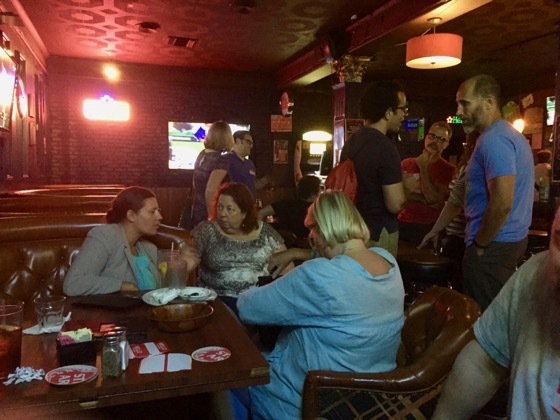 Over the years, I have gotten tired of driving over the hill to attend this or that Meetup. Here are some pictures from the evening. I hope to hold another one of these in a month. I’m planning on setting up some tables by the type of podcasting people are interested in and also one for technical questions so we can all get our questions answered and find people we can collaborate with. 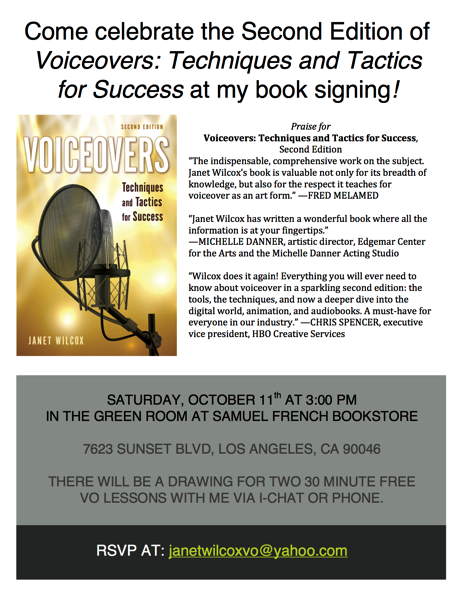 Voiceovers: Techniques and Tactics for Success at my book signing! THERE WILL BE A DRAWING FOR TWO 30 MINUTE FREE VO LESSONS WITH ME VIA I-CHAT OR PHONE. Today we attended a great Meetup on robotics at the same place (NTMA Training Center in Santa Fe Springs) where Joseph competed in his school BattleBots tournaments. Organizer, Richard Loehnig, brought in experienced roboticist, Dr. Jason Bardis — creator of several BattleBots for hobby and the BattleBots television show, including Dr. Inferno, Jr. It was a great talk that covered Dr. Bardis’ experience with robots from his initial hobbyist forays to helps build the robot arms for the Curiosity Mars Rover and more. It was a great talk, but something else struck me as even more important. 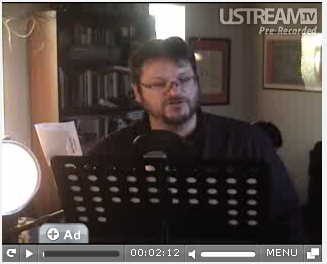 NTMA, Richard and Brad took great pains to stream the talk and record it for future viewing. This was a perfect example of what we should all be doing when organize, host or create great content. We had about 40 people in the room with us today, but there is a potential audience of thousands on the Internet, where this video can live on forever. Why would you NOT capture such great content? Every time I see that happen I consider it such a great waste of information and also a waste of the presenters and organizers time. It may be a one time event, but video can continue to work towards your goals 24/7 for the foreseeable future. You don’t have to go all out, like the NTMA folks did today. I counted at least 4 video cameras as well as the live stream and a high quality audio recording. If you have nothing else, use your iPhone, your iPad, your Android tablet whatever you have at hand. If you are doing video, find a way to prop up the device, so the video is as smooth as possible. For me, though, capturing the content is far more important than professional quality video. Yes, make it as easy to watch and hear as possible, but first, capture it! 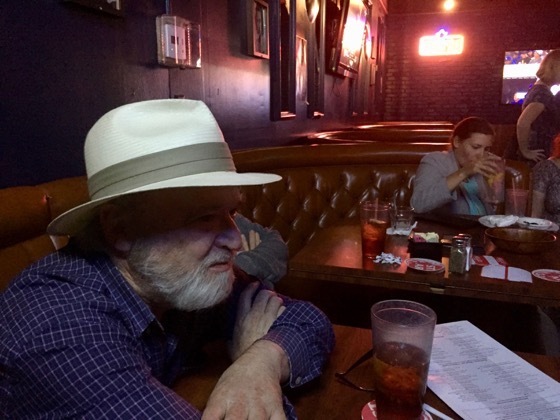 For myself, I have a variety of ways of capturing content when I am out and about. I have my iPhone, of course, Rosanne’s iPad, an HD camcorder with external mice and a tripod, a still camera that also takes video, Joseph’s iPhone and even an ancient iRiver IFP audio recorder that I can press into service, if needed. I am sure you have plenty of devices in your own kit that could also be used — if you only took the time to do it. If you are hosting an event, record it so you can share it on your own web site and social media channels and also offer it up to your speaker for their own usage. 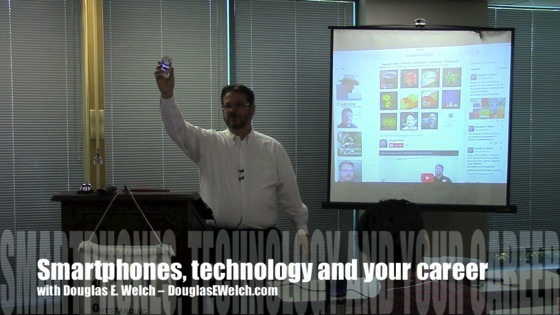 If you are speaking or presenting, always come prepared to record yourself so that you gave content to use later. In many cases, you can offer this back to your organizer so they have something to share, even if they didn’t think of recording it themselves. Set a good example and capture everything you do. Encourage others to do it, too. I know there is a lot of content I would have liked to see, if only the speaker, the musician, the presenter, the performer would have taken the time to capture it. 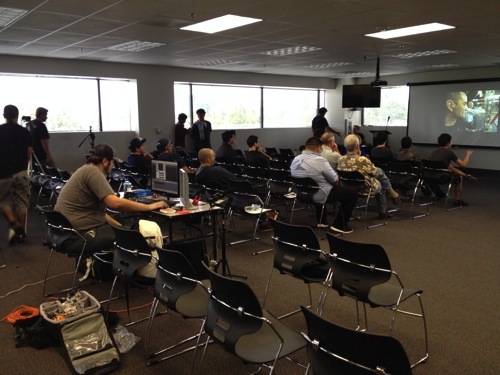 You can join NTMA for future robotics Meetup by joining their Meetup group at the SoCal Combat Robotics Meetup site. U.S., Canada, China, France, Hong Kong, Italy, Japan, the Netherlands, Spain, Switzerland, and the U.K. in the months of July and August. Enrollment is free, and parents can sign up at AppleRSVP.com as registration opens in their region. In the “Stories in Motion with iMovie” camp, Apple will teach young learners how to create movies on their Mac using Final Cut’s little brother. Apple says the curriculum will include storyboarding, filming, creating a soundtrack using the iPad’s unique version of GarageBand, and finally bringing the final edit together on a Mac. 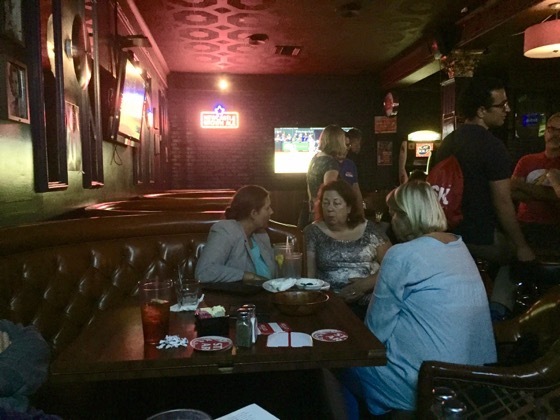 I’ll be speaking on Content Creation and Blogging at the next San Fernando Valley WordPress Meetup. Come and join me and Glen Bennett, who will be speaking on “The Ecosystem of WordPress” and how it can work for you. Creating content is an ongoing demand for any website, in particular a WordPress site. Yet doing so, keeping it fresh and keeping it consistent can be a tough challenge. 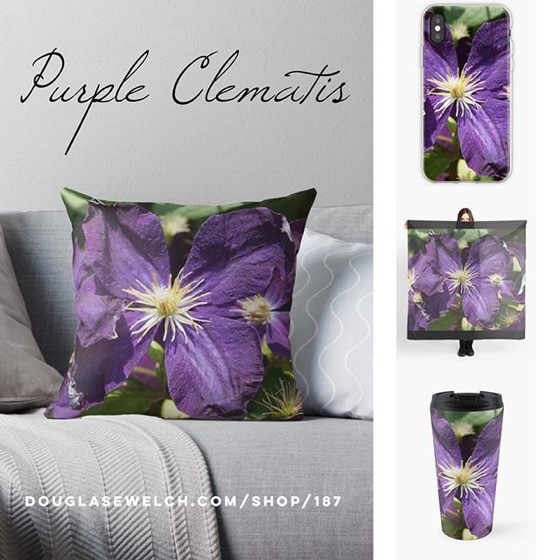 We have a professional blogger, Douglas Welch, with over 10 years of writing experience that will be sharing his work flow and many years of accumulated “how to” information. With plenty of opportunity to ask questions and interact we hope that this will provide just the knowledge and inspiration to make your WordPress site sing. Then we will have a presentation from Glenn Bennett on the ecosystem of WordPress, bet you didn’t know that they had one! An ecosystem is a community of living and non-living things that work together. In the WordPress world there is a vast network of resources to be tapped and to link into. Find out more about what exists and how to use this ecosystem to really take of with your own WordPress site(s). Bring your blogging questions! I always make a point of allowing plenty of time for Q&A every time I speak, so this is your chance to get your most burning blogging questions answered. 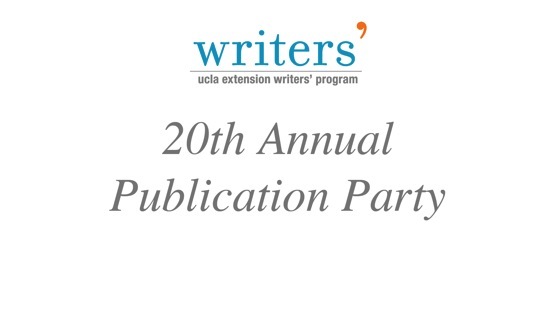 Below is a playlist of some additional work we recently produced for the UCLA Extension Writers’ Program — recording and editing individual author videos from their 20th Annual Publication Party. Six videos are currently available with another 12 coming soon. You will eventually see all 18 videos on this playlist. If you a writer, I highly recommend subscribing to the UCLA Extension Writer’s Program YouTube Channel for more great content like this and the author interviews we produced for their new books television and film writing, Cut to the Chase and Inside the Room. As part of the Dog Days of Podcasting (http:/dogdaysofpodcasting.com) I am showing off a wide variety of podcasting styles and methods. 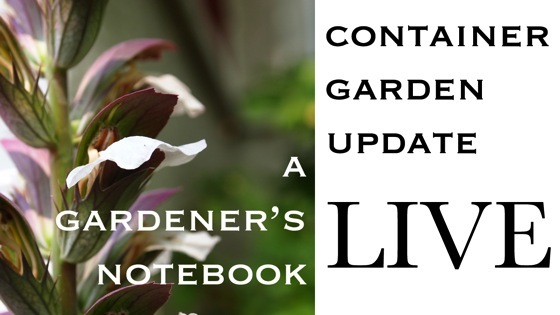 Today, I will be streaming my weekly series, Container Garden Update, LIVE using Google+ Hangouts on Air. Join us at 7pm EDT/4pm PDT, using the links below, to watch and interact live. Watch live and ask questions via Twitter, Google+ and more. 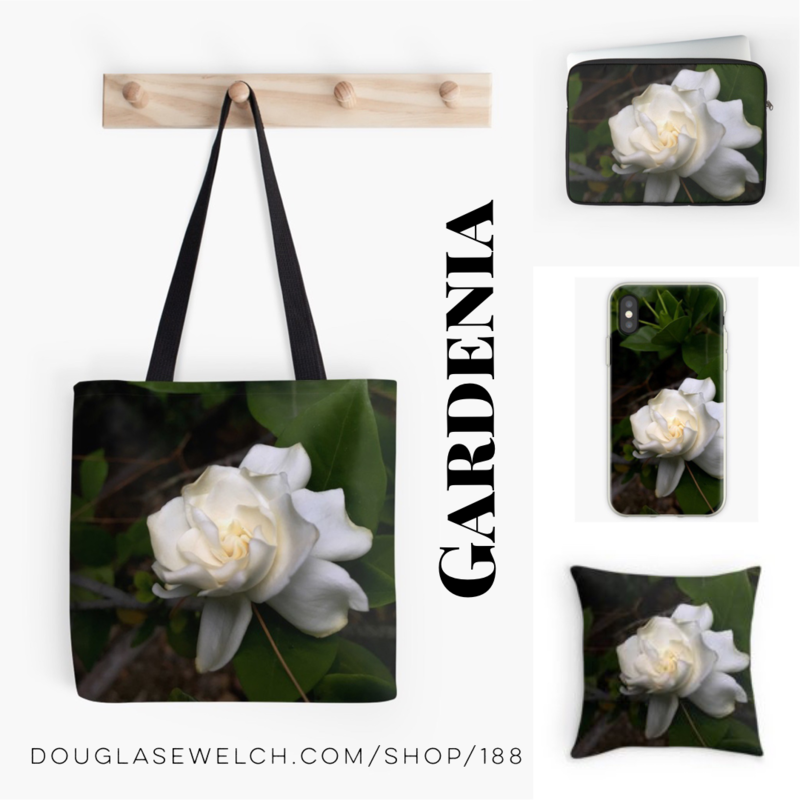 I will embed the video on A Gardener’s Notebook blog page, (http://welchwrite.com/agn/) too, so you can watch directly from there. Dog Days of Podcasting – Halfway There! – What are your thoughts? So, as of today we are 15 days into the Dog Days of Podcasting Challenge. It has been somewhat easier than I thought, as I have a number of shows I try to produce regularly, so I only have to fill the holes that remain. Still, it as also gotten me moving on some ideas I have had for a long time. Today’s podcast, MineFull – A Minecraft Let’s Play, has been in my mind for a long time, but I never had enough motivation to get moving on it. Things always seemed to get in the way and the thought of doing a podcast about playing a game seemed a bit frivolous. That said, it is a different form of podcast than anything I have done in the past, so it is a great stretch of my podcasting muscles. I had also been meaning to do many more interviews for all the podcasts, but most especially Career Opportunities. I think it is so important to introduce readers and listeners to new people, new jobs, new careers and new ideas in order to help them grow. Again, the Dog Days finally got me moving on that project, along with some new equipment that was purchased for producing a series of videos for a client. I now have a better video camera, better mics and, most importantly, some decent lighting for shooting indoors, especially for interviews. I have recorded 3 interviews so far and will record another one today. I will probably be releasing them once per week for the next several weeks. I thought at the beginning of the challenge I might have to fill in with more stream-of-conciousness audio podcasts in order to fill all the podcast slots, but that hasn’t happened. That said, I may still do some of those merely as a way of playing around and showing the possibilities of Podcasting and New Media. Of course, now I want to hear what you think about the Dog Days of Podcasting Challenge as we head into the downhill portion of the month. Has it been illuminating, boring, challenging, frightening, enlightening? Have you listened to or watched other podcasters who are taking the challenge? You can find all our podcasts over the on Dog Days of Podcasting web site and associated RSS feed. You can even subscribe to the feed and have each days podcasts automatically downloaded and moved to your iTunes, iPod, iPhone or iPad. Leave some comments to tell me what you think AND what you’d like to see and hear in the next 15 days of the Dog Days of Podcasting Challenge! 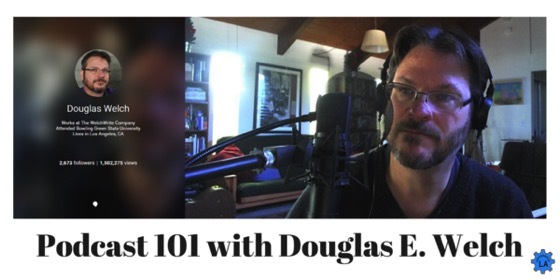 A 30 Podcast in 30 Days Challenge taken by a wide variety of podcasters including the host of New Media Answers, Douglas E. Welch. Intro/Outro Music: “Slow Burn” by Kevin MacLeod (http://incompetech.com) under Creative Commons License. 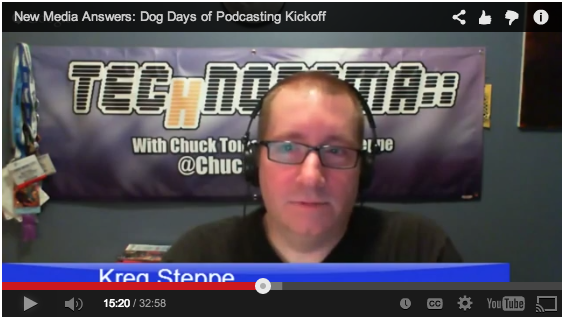 Fellow Friends in Tech member, Kreg Steppe started the first Dog Days of Podcasting Challenge in 2012, as a way to kickstart his own podcasting efforts. I missed that announcement, but I am jumping on board for this years challenge and you should too! What a great way to try out new styles, new shows, new ideas and generally get your podcasting feet moving! Join the Dog Days of Podcasting Challenge! What is the Dog Days of Podcasting? Essentially, it is a challenge to do a podcast for 30 days in a row. In 2012 Kreg Steppe was looking to give himself a little push in regards to recording his own personal podcast since he wasn’t recording it very often. That turned into a challenge for himself to record a show everyday for 30 days believing that after 30 days it would turn into a habit. Once it was mentioned to Chuck Tomasi he took the challenge too and they decided it would be a great idea to record starting 30 days before Dragon*Con, culminating with the last episode where they would record it together when they saw each other there. Turns out there were some of our friends that also wanted to get in on the action and took the challenge too. So it grew into a challenge 7 of us took. This year we are inviting more podcasters to get in on the action. Keep in mind, it’s a fun challenge, and you will not be shamed (too much) if you don’t record every 30 day. It is kind of like the way Drew Carey describes “Whose line is it anyway?”. A fun game were we earn points, but the points don’t matter. What matters is that we all have fun recording and listening to each other. Rules: Podcast Once a day for 30 days. Show length is up to you. Most vary from 3 – 5 Min. I’ll be posting my daily shows here during the challenge, but I will also be including my usual podcast selection as part of the 30 days, so you should see podcasts on careers, new media, gardening, technology and more! LIVE: Watch and donate to Child’s Play Charity Today and this Weekend! A couple of my favorite Minecraft YouTubers are spending the weekend live streaming their gameplay for Child’s Play Charity — raising funds that provide games and toys for hospitalized youth. One of my posts from 2010, “What do you need to live video stream your event?” is one of the most popular posts on my web site, according to my stats. This post also leads to a large number of emails from folks with questions about live streaming. I had a great question and answer session via email with a reader the other day and wanted to sure my answers with all of you. I hope that this is useful to you and answers some of the questions you might have about live streaming. First, let me say that I am a big proponent of starting to stream in any way possible and then building up the quality of your streams as you go. This allows you get some of the benefits of streaming while still learning and building up your equipment. Perfect is good, but done is better. I recommend jumping in and just “doing” it — even as practice. You will learn so much. 1. What type of cameras do we need? We were going to start with 2 (2 different angles), but we don’t know what TYPE of cameras we need. What do they need to be equipped with? 2. We need a switcher, yes? We’ll be switching from 1 angle to another during the stream. If you want to have multiple cameras, yes, you will probably need a switcher. That said, on a very low-end scale, you could also have 2 webcams and then switch which input is being used by the streaming site at any time. This is a pretty low-end way of doing it, but it works and would allow you to experiment a bit first. 3. We were told we also need a streaming encoder. Do we? A streaming encoder is used for higher-end situations. Basically it is just a locally run piece of software the pre-encodes the signal before sending it along to the streaming site. For most free streaming setups, this encoding is done by the site. You may not need this initially. 4. Can a switcher and an encoder be part of the same equipment? Yes, there are a couple of systems that have been introduced lately that are basically rack mounted streaming “systems” that include switch, encoder, a PC with network/wifi, etc. 5. We are NOT looking to TAPE the concert for later viewing. Do we still need a “capture card”? Most streaming sites will also record and archive your show for later watching, but you can also capture a copy locally yourself. In this case, your local copy will always be of higher quality than the streamed version, due to bandwidth limitations, etc. I think archiving your streams is a great idea as you will always have many more views from the recorded versions that you will from the live stream. Live streams require people to be in a particular place at a particular time and so limit the number of people who can “attend”. Recorded versions can be watched whenever and wherever the person might be, so more people view it. This is not to say you can’t charge for access to these recorded versions. You don’t have to give them away for free. 6. How LARGE a computer do we need? What type of capacity does that computer need to have? You want the fastest computer you can get, with plenty of memory (4GB-8GB) and several large hard drives (1TB+) Audio and video files can grow very large and you need enough space to hold each show, archived shows and editing space, if you want to edit or convert the files. 7. How do we get the live feed onto our website? When using a streaming service like uStream.tv, etc, they provide you an “embed code” that you simply copy and paste to your site or anywhere else you want the stream to appear. It is just a small snippet of HTML that should work nearly anywhere. 8. How can we sell tickets on their website via Pay-Per-View? Sorry, that is outside my knowledge area, unfortunately. 9. We want the best quality — HD — that we can get, although we’re on a very strapped (i.e., small) budget. Surprisingly, even a consumer camcorder can take quite decent 1080p HD video. The streaming software/equipment/service/bandwidth will always be the limiting factor for the foreseeable future. I hope this has helped a bit. My knowledge is more at the level of the “beginner” live streamer, so I am not sure what more I can offer. Watch the recorded video below! Nichelle Stephens from Cupcakes Take the Cake! 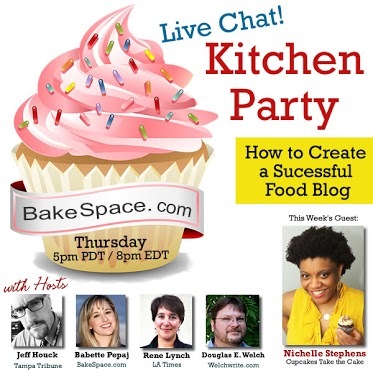 We’re talking Cupcake Recipes & how to #publish a successful food blog. 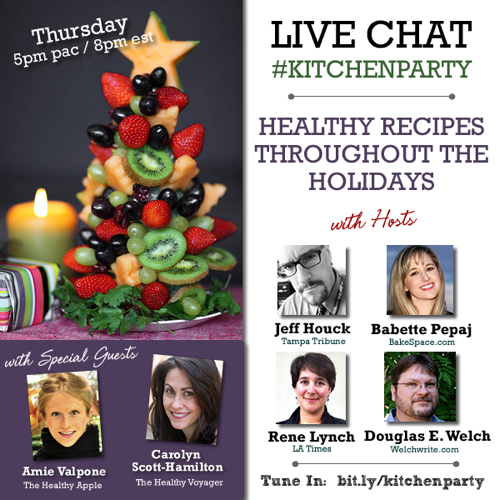 Join us for our next KitchenParty show and live chat on Thursday, October 11th at 5pm pacific/8pm eastern. This week’s guests are: Amie Valpone, The Healthy Apple and Carolyn Scott-Hamilton, The Healthy Voyager. There’s no denying New Media Expo offers valuable learning opportunities. With almost 90 educational sessions presented by the leading experts in new media content creation, podcasters, bloggers and webTV and video producers always return home inspired and ready to put what they learned to good use. We love that our attendees take time to share with us that we’ve provided such a valuable educational opportunity, but we also hear from content creators who would love to attend our event but can’t get here for a variety of reasons. We’re about to make it easier for one person. Throughout the month of October, we’re accepting applications for the first ever (and hopefully not the last) New Media Expo University scholarship. Offered as part of our new New Media Expo University (#NMXU) educational project, this scholarship will provide a complete educational experience at NMX in Las Vegas from January 6th through 8th 2013 for one lucky recipient. 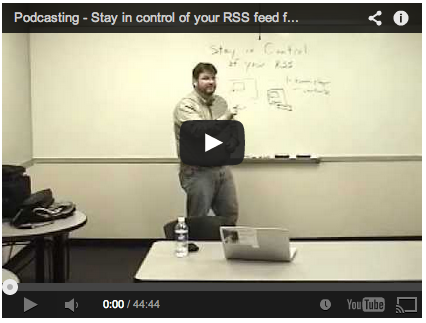 It is important for podcasters to start out on the right foot when setting up the RSS feeds for their podcasts. The RSS feed is their main connection with their subscribers and losing control of that feed can be disastrous to communicating with and maintaining their audience. MCA-i’s signature event, MediaProCamp, sponsored by Panasonic for the second consecutive year is again FREE to media pros who pre-register on line! 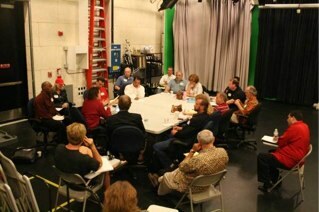 MediaProCamp is really an all-day (9:00 to 3:00 pm) series of roundtable discussions among working media professionals. The idea is that no one is an expert on everything and yet we all have valuable expertise and experience to share. The result is a dynamic, unpredictable fun experience of problem-solving, sharing and networking among expert professionals! Doorprizes: We’re gathering number of professional services and products to raffle off. Again this year Adobe has offered us their new CS6 post production software package to give away to one lucky attendee! And Colin Smith Smith, a noted Adobe trainer, best-selling author and award-winning new-media designer, will be holding a training session on CS6. Colin is also founder of the world’s most popular Photoshop resource site, www.PhotoshopCAFE.com which boasts over three million visitors. Panasonic is in the process of arranging for a filmmaker-cinematographer to speak to us about what we can expect from the many changes in digital videography that have recently affected movie making and other media. MCA-i’s Walter Davis, a producer-director-writer, and generous mentor will be giving a presentation as well. He is also an internet media entrepreneur with several Internet TV and Radio channels currently running. At past MediaProCamps, Mr. Davis enthralled attendees with valuable tips on Utilizing Internet TV for Profit; Mobile Apps; and Making Money On The Web. So you can be sure that his offering at the 2012 MediaProCamp will be interesting and valuable to your media business. You can expect to meet any number of well-known media pros at the event but it’s not about lectures it’s about collaborating! Bring YOUR ideas. You may be voted on to make a presentation! TIME: Doors open at 8:15 AM for Registration and networking over free coffee etc.. Roundtable Seminars begin at 9:00 AM FREE LUNCH included thanks to Panasonic! YOU MUST REGISTER ONLINE SO WE CAN GET AN ACCURATE COUNT FOR FOOD! 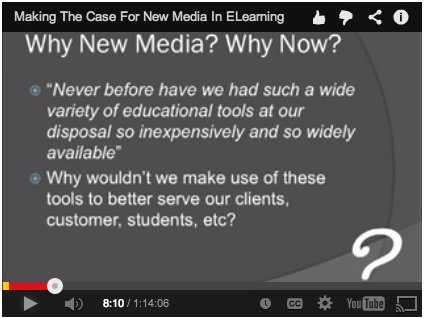 This presentation was recorded as part of the ELearning Guild’s Online Forums in 2010. I still find it to be a great overview of why new media is important and how it can be used in a variety of environments — not just elearning.